Some years ago, when working in association for what used to be EMI, I had a happy involvement in the creation of Schubert Lieder on Record. I and my friend Tony Locantro, who knows more of EMI’s back catalogue than anyone alive, sifted through hundreds (and hundreds) of recordings made over a century; since the fragile dawn of the recording era, in fact, when this music could be found in the piano-stool library of any domestic musician. We squeezed almost a hundred singers of around 250 songs onto 17CDs. Faced with such a monument, like picking your way up a fell, you have to make choices. To begin with, perhaps, the well-trodden path, Ave Maria, An die Musik, Die Forelle and the like. Then what? When compiling the box, we commissioned an essay from Richard Stokes, who knows about Schubert what Tony knows about EMI, and more. Addressing Schubert through his poets, laying out the landscape of his Lieder like a musical Wainwright, he pointed out many paths less taken, all leading to the point of how Schubert married words and music. For now, my guide is Mayrhofer. 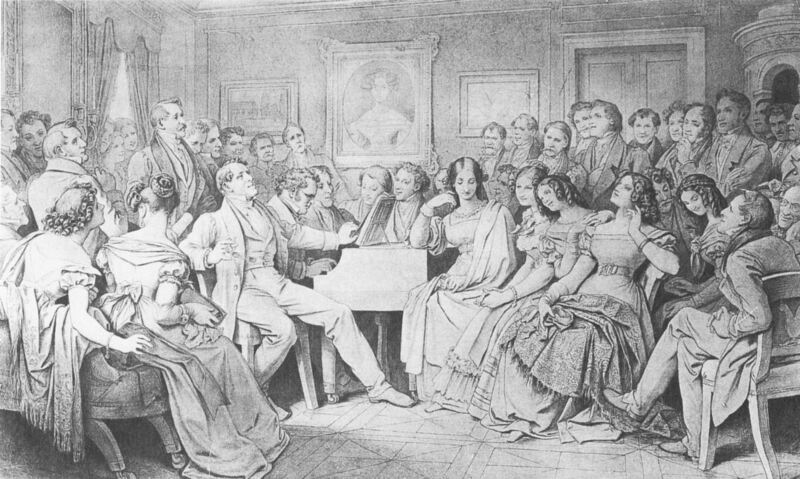 A Schubertiade reinvented by one of its participants, Moritz von Schwind. Mayrhofer is looking on from the far right. I like Mayrhofer. A decade older than Schubert, he had undertaken theological training at the same monastery – St Florian, near Linz – where Bruckner was to become organist half a century later. The resurrected glory of the Greeks surfaces in his poetry, which Schubert set to music in 47 songs – more than Schiller, more than anyone save Goethe. The two men quickly became friends and partners in creation after their first meeting in 1814 and shared a room for two years (1818-1820) while Mayrhofer was studying law in Vienna, before Schubert moved out by strained mutual consent: the elder man’s fastidiousness contrasted sharply with Schubert’s personal habits. Graham Johnson suggests there may have been more to it than that, adjacent to Greek homoeroticism. Such truth as we have lies in the songs. Einsamkeit D620 begins with a tremendous chromatic weight pressed on the shoulders of its narrator as he evokes the mixed blessings of loneliness in terms now so familiar as almost to be drowned by cliché. The young Mayrhofer in his cell at St Florian, set by Schubert teaching young countesses in deepest Hungary at the time: who would expect anything less than ‘Give me my fill of loneliness’? What emerges, however, is a life in a song, as the poet passes through the social whirl, pastime with good company, rapt silence with a lover, victorious deeds, only to return, older and wiser, to solitude – ‘the young man’s longing’. How personal is Schubert’s opening out into C major for a little Ländler in praise of friendship. Don Quixote is here in nuce, so too the Prodigal Son, maybe even the journeymen of Die schone Mullerin and Winterreise. Einsamkeit is rarely done in concert, due no doubt to its length – around 20 minutes – but I was fortunate to finally hear it live for the first time last Saturday as part of a long and fulfilling evening at Kings Place, itself merely the prelude to the Oxford Lieder Festival, which will present all of Schubert’s songs over the next three weeks. Accompanied by the festival’s director, Sholto Kynoch, Stephan Loges sang Einsamkeit with wondrously steady restraint (in Oxford, it will be done by the great Robert Holl on 28 October). Later in the evening the tenor Robert Murray contributed a still and poised account of Abendstern D806, which like other Mayrhofer/Schubert masterpieces sublimates Classical allusion in the evocation of a lost world of nobility and purity, far from the ‘wretched fashionable stuff’ that the composer complained was pushing his songs out of the limelight. For all his famed conviviality, he was as high-minded about art as the earnest part-time poets such as Mayrhofer in whom he found intellectual mentors. Between these song sequences, the soloists of the OAE gave a perfectly unbuttoned account of Beethoven’s Septet, containing, just about, seven separate and fascinating personalities brought together as if at a Schubertiade by one common association but not necessarily friendship or sympathy. Luise Buchberger’s cello solos in the two trios were delicately assertive against the introvert virtuosity of leader Matthew Truscott, Rudi Schwerdtfeger to the tee. Led by Anthony Pay’s clarinet, the wind contingent seemed sometimes to carry on its own business regardless. 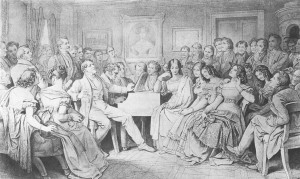 All these quirks so suited to the Beethoven left Schubert’s Octet somewhat bereft of the direction and unity – tuning and ensemble periodically drifting apart too – that this proto-symphonic work needs, especially when given with all the repeats (they may be fresher when they do the Octet again in Oxford on 17 October, without the Septet). A long hour at the end of a long day, but with many of Schubert’s heavenly lengths along the way. A footnote about poor Mayrhofer. He threw himself out of a window one day in February 1836, apparently in despair over his impossible love for the teenage daughter of his landlord. Writers in English are slowly adapting to the principle that since suicide is no longer illegal, one does not commit it. Alas the Germans have this injustice hard-wired into their language with the cruel expression Selbstmord. My dictionary lists the true (even Romantically apt?) Freitod as merely a euphemism. Time to change?